Okay, I should be working on my first final of the quarter (a 72-hour take-home exam about the protection of cultural property), but instead I’m going to update my blog because I’m sure you are all waiting with bated breath for my next entry! On Monday, Colton and I had another big day in Marseille. 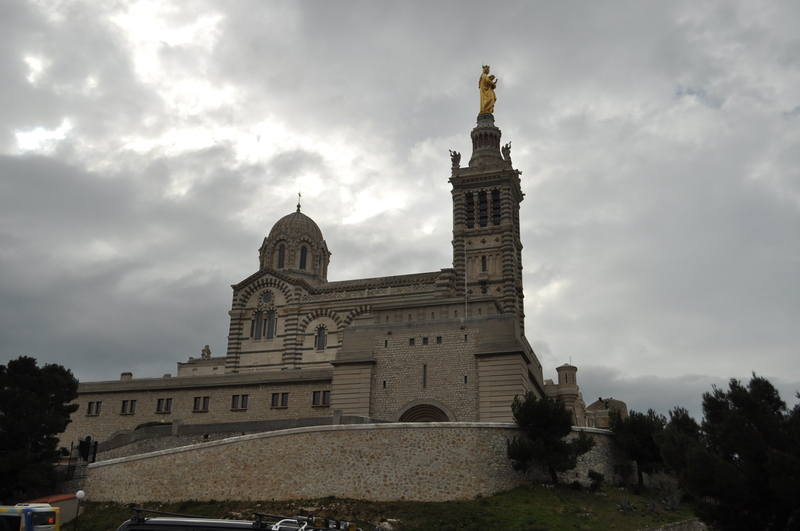 Our first goal was to head to the Notre Dame de la Garde. I had wanted to hike up to the church, but we got a late start on the day. So, instead, we purchased some sandwiches and desserts (lemon meringue tart – yum!) and took the bus up the hill. 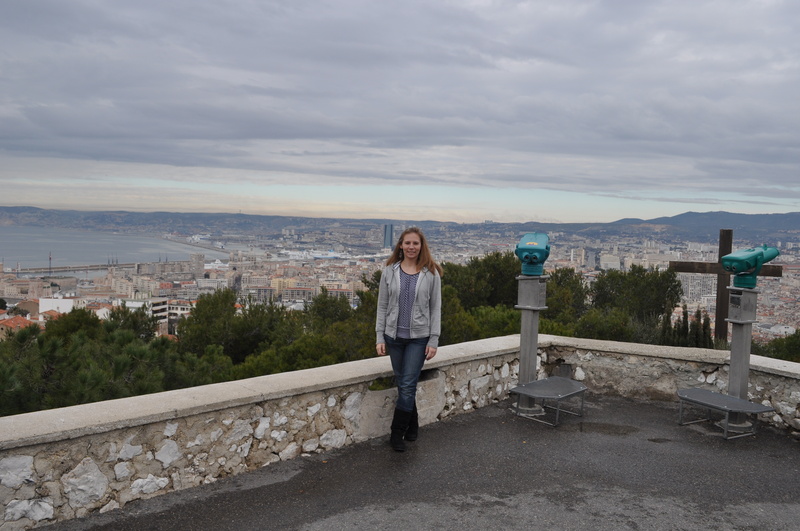 The view of Marseille from the base of the Notre Dame de la Garde. 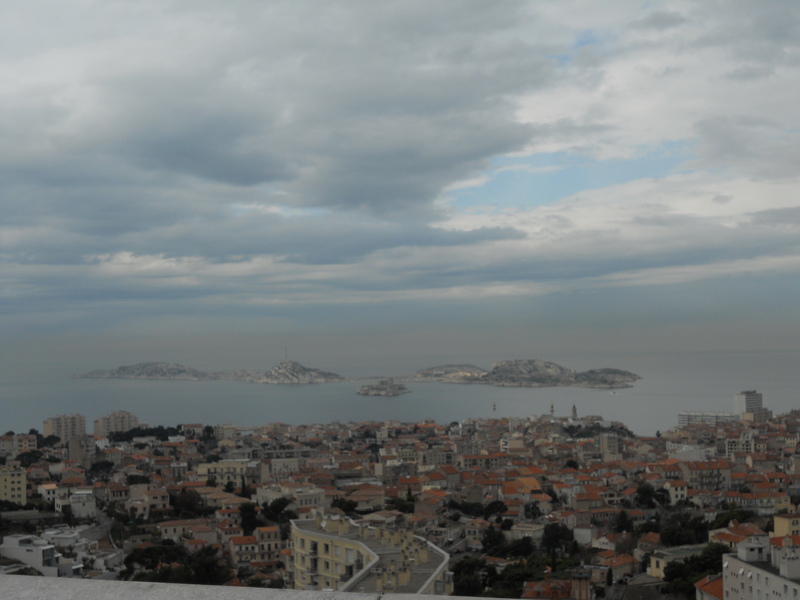 The view of the Notre Dame de la Garde wasn’t bad either. The gold statue at the top is gigantic! 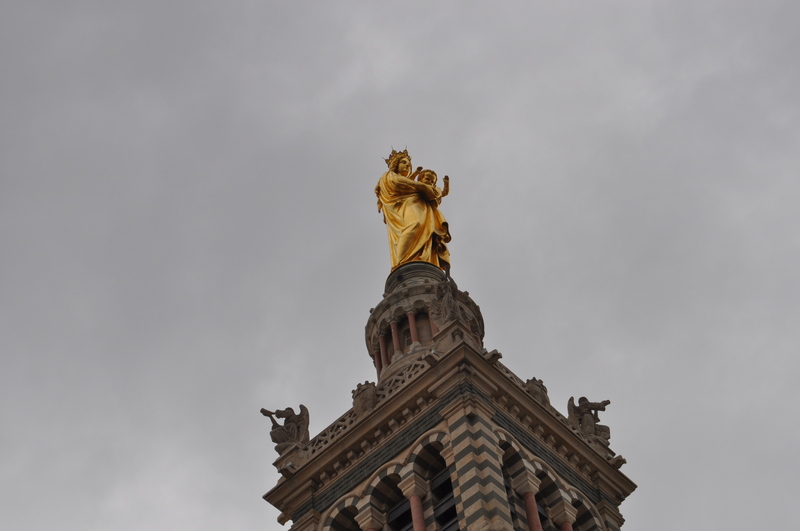 The gold statue on the top of the Notre Dame de la Garde. The statue (in case it’s not clear in the picture) is of Mary with Jesus as a young child. The wrist of the child Jesus measures 1.1 meters! That’s really big. And it weighs a lot, too – the statue, made out of copper gilded with gold leaf, weighs almost 10,000 kg. 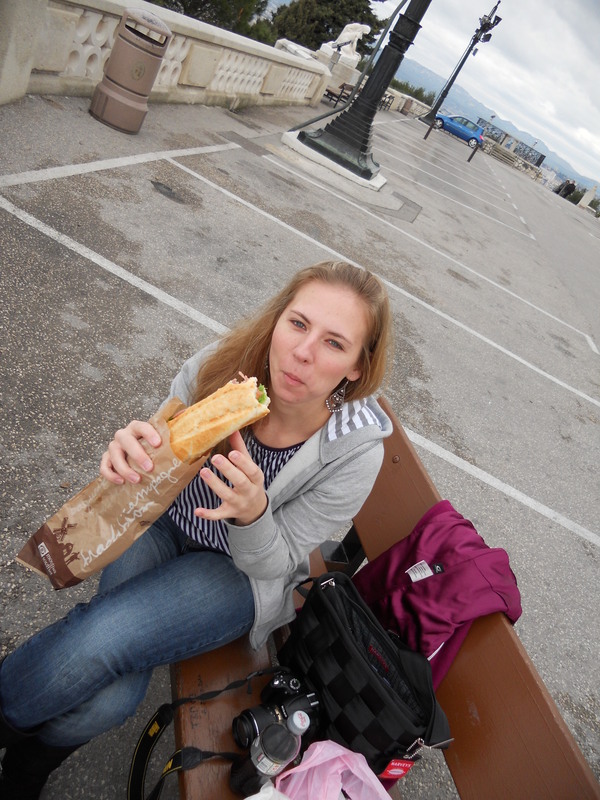 After checking out the views and the outside of the Notre Dame, we decided to enjoy our picnic. After eating up sandwiches and delicious lemon meringue tarts, we headed into the Notre Dame de la Garde to check out the interior. 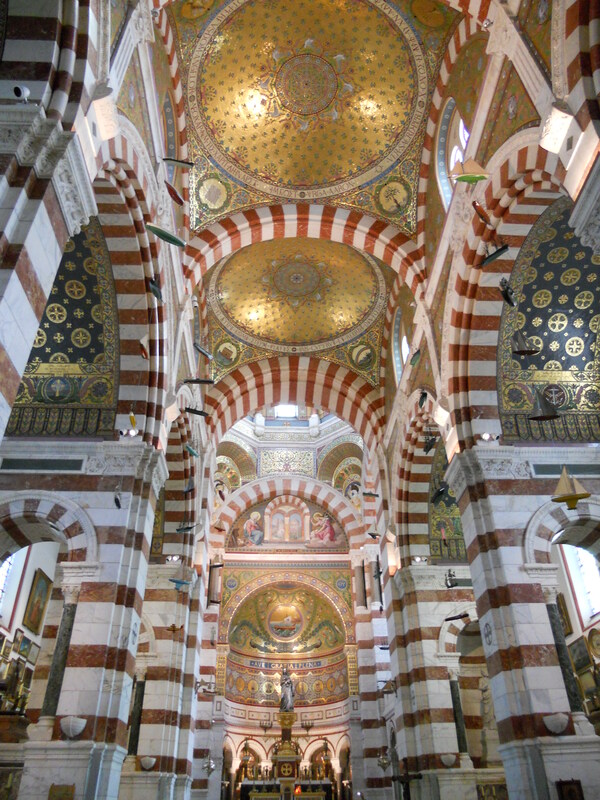 Inside the Notre Dame de la Garde. It was incredibly ornate and had some beautiful stained glass windows. 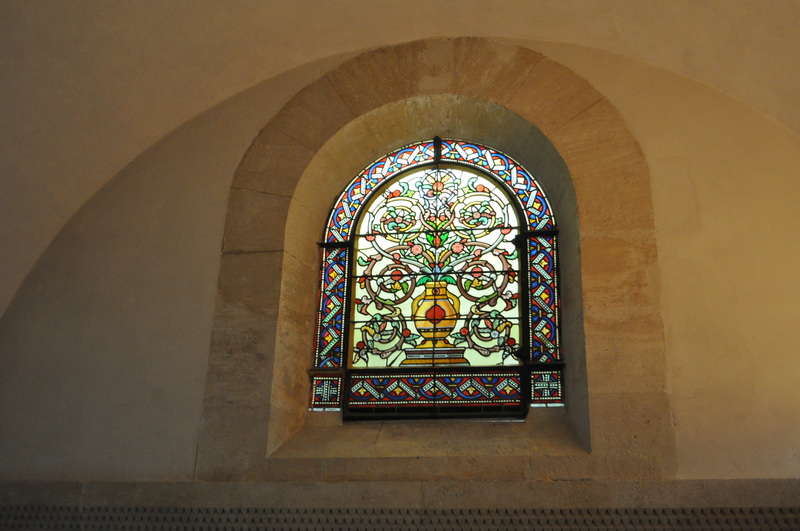 Stained glass window inside the Notre Dame de la Garde. After admiring the interior for a bit, we headed back outside to check out some more of the views. 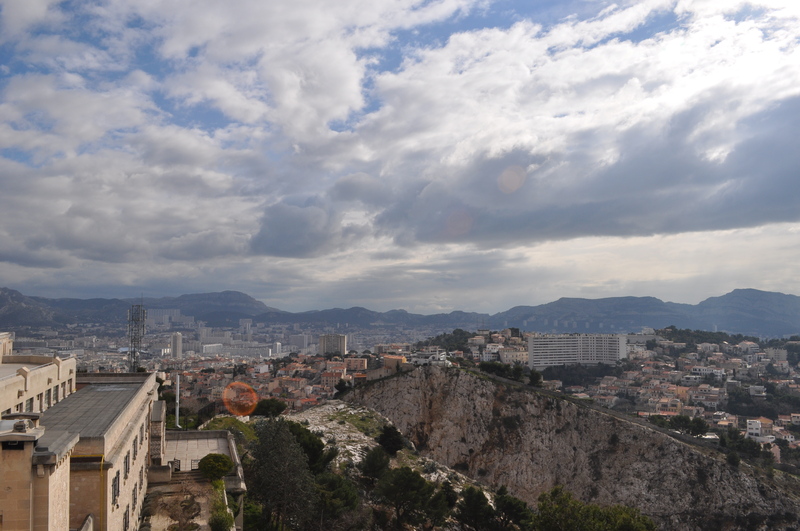 The view from the Notre Dame de la Garde. The small island in the middle in the above picture contains the prison where The Count of Monte Cristo was set. After we’d gotten enough of the views, we decided to hike back down to the city center. I like wandering around streets and seeing different shops and houses, so I really enjoyed the walk. Isaac – how’s that for city planning? We made sure to do some soap shopping since Marseille is known for its soap. We visited a couple of soap stores, including this one, which was my favorite. I bought some grape-seed soap, which is the most amazing smelling soap I’ve ever smelled (smelt?). We also saw some wonderful displays in the stores we passed. 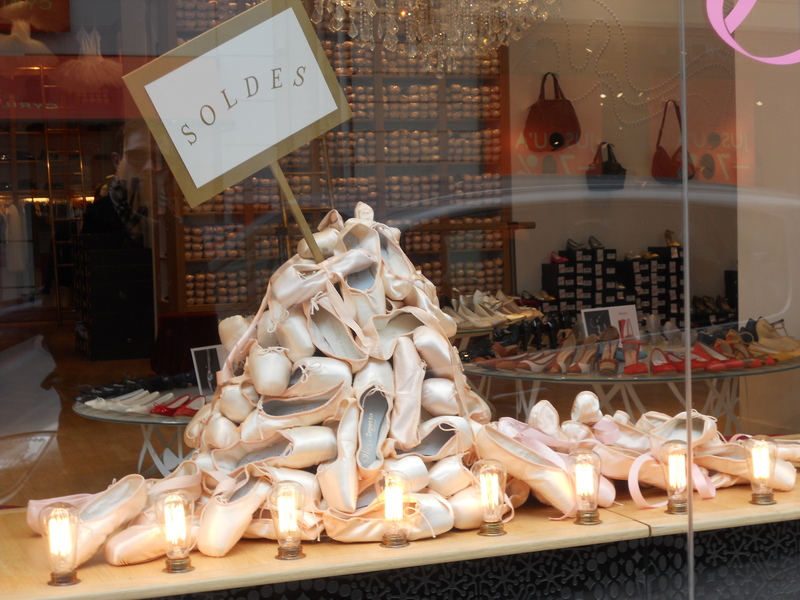 A shoe store with a sale sign and an awesome display. What could be better? 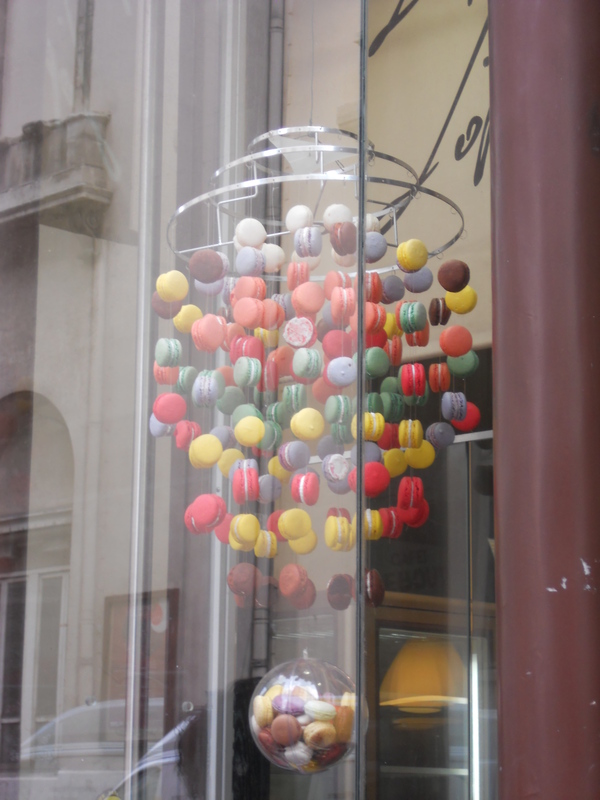 Display of Macarons - my new favorite cookies! We passed a cool looking statue along the way. 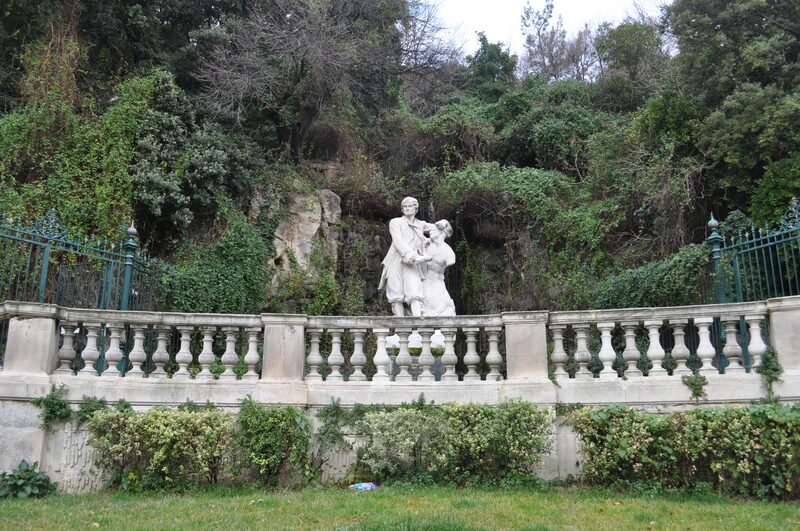 A statue of Puget and a waterfall in Marseille. 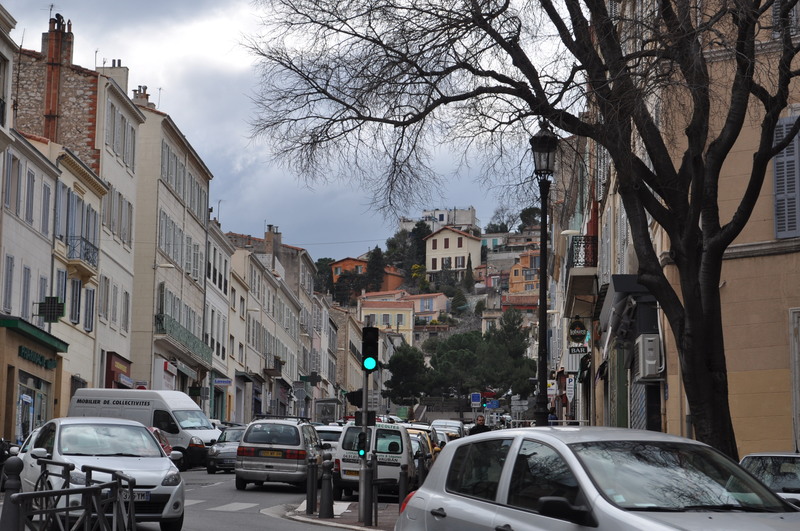 Then, while stopped on the street looking at the map trying to figure out where exactly in Marseille we were, a very nice French man stopped and asked where we were headed. 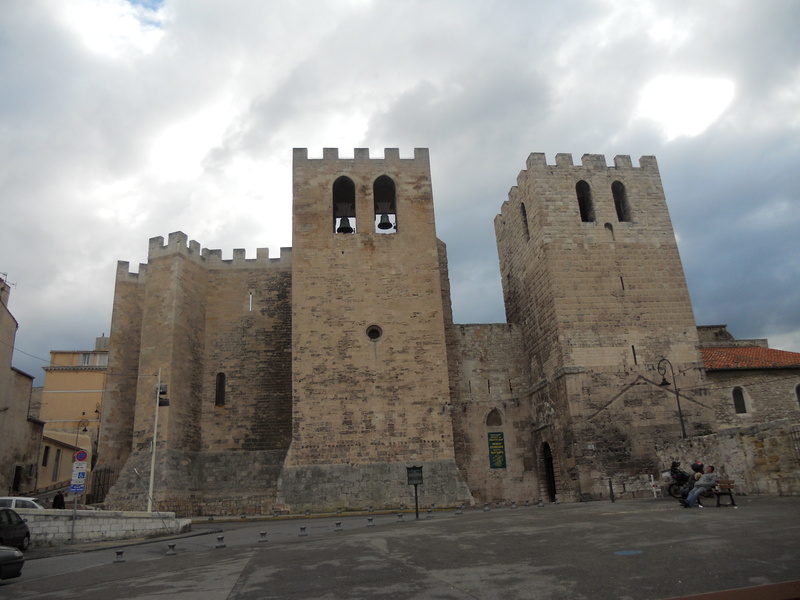 He suggested that we visit an abbey, which was built back in the 5th century! 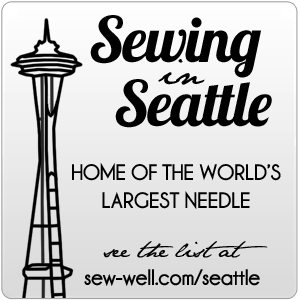 (Makes all the buildings in Seattle seem like babies!) So, we headed in that direction. The Abbaye St. Victor in Marseille. 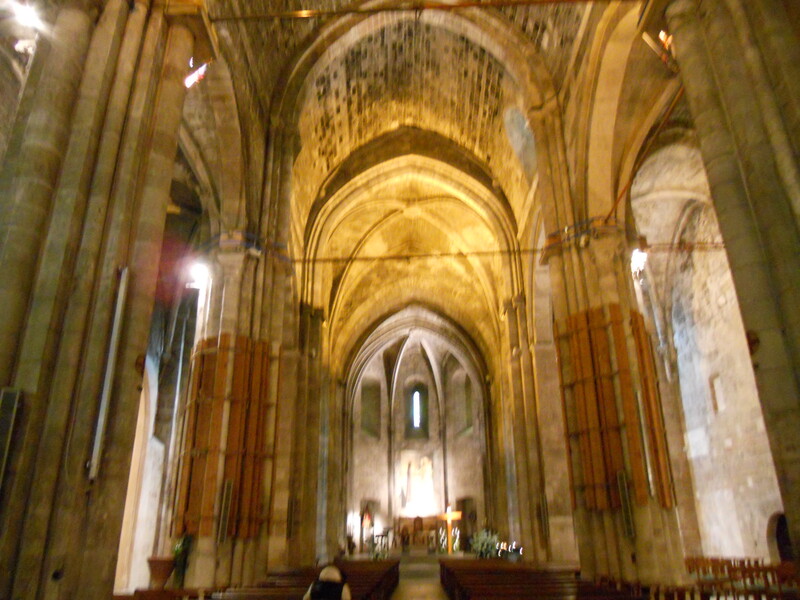 The inside of the abbey was very cool. 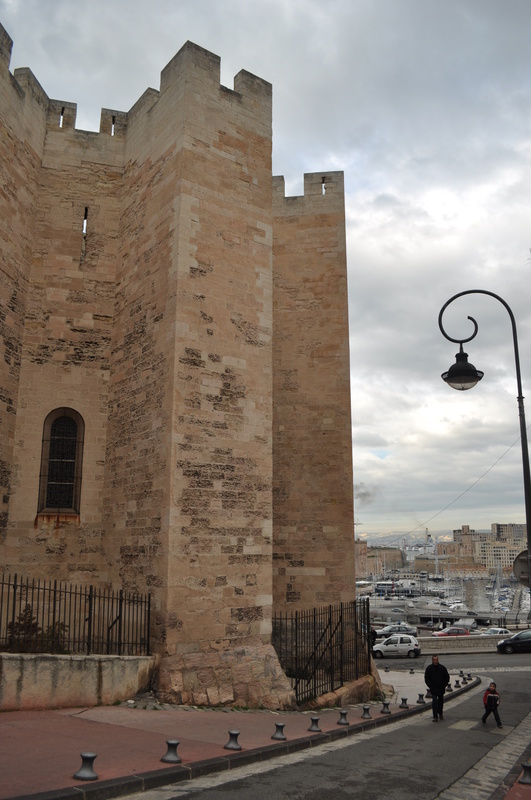 After we left the abbey, we wandered along the waterfront in an attempt to get to Le Panier, the old district of Marseille. The abbey and the waterfront. But, I’ll have to cover the rest of the day at another time. I should really get back to the final (and this blog post is long enough as it is!). Stay tuned! I am so envious of your travels… The pictures are great.